I love going to The Cheesecake Factory, and I always get the same thing. Chicken cacciatore, with asparagus and baby red mashed potatoes. I decided to look online for the recipe and I found one that seemed to be pretty acurate so I tried it last night. I paired it with chicken that I marinated in raspberry vinigrette dressing and also some asparagus and I couldnt be happier with how it turned out. 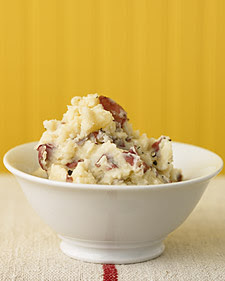 If your looking for a great mashed potatoes recipe, look no further. - Cut away blemishes in potato skins, and cube. - Boil potatoes until very soft and drain off water. - Add butter and salt, and whip with a rotary beater until butter melts. - Whip in remaining ingredients. Seriously...when are you going to come and cook for me????? Like full time!